Windows is now a ‘service’ and as such it will receive major ‘version’ updates twice each year. It was not always so, but now we all now moseying down that path. It’s a good time to review the versions of Windows 10 that have been released thus far because soon you won’t be able to tell the players without a scorecard — and you know what we mean! Version 1511: This version is also known as the November update. Windows 10 version 1511 was released on November 12, 2015. Version 1803: Also known as April 2018 update, it was released on April 20, 2019. Version 1809: The October 2018 update was originally released on October 5, 2019, however, Microsoft stop distribution after serious problems were discovered. Version 1809 was re-released on November 13, 2018. It is still rolling out and as of March 1, 2019, only about 25% of Windows 10 users had been updated to Windows 10 version 1809. 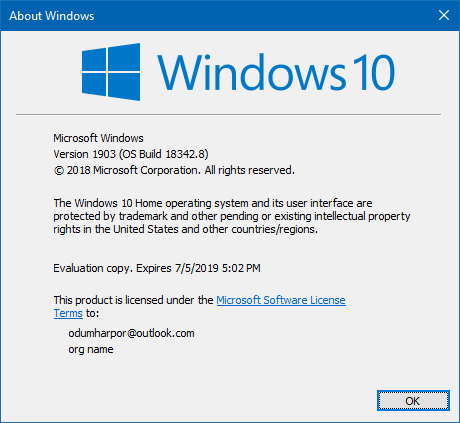 Version 1903: Windows 10 version 1903 is expected to be released in April or May of 2019, , but as of today,, no official release date has been announced. I still have version 1803, yet windows tells me I am up to date. what’s with that? And how can I get the latest updates? Thanks for all your help over the years! This appears in today’s (March 22, 2019) InfoAve Premium Newsletter Issue #806. Let us put your mind at ease – about 75% of Windows 10 computers, as of March 19, 2019 are up to date, yet have Windows 10 Version 1803. This is because of the rollout of the October 2018 being stopped after five days because it was causing some users to lose all personal data. It was not until five weeks later, on November 13, 2018 that Microsoft restarted the rollout of Version 1809 and then at an intentionally slow rate. So, actually you’re in the majority – most Windows 10 users don’t have Windows 10 Version 1809 – only about 25% do. Yet all those who have Version 1803 who have installed all the cumulative updates from Windows updates over the weeks and months since Version 1809 was released are technically up-to-date. With the April 2019 Update – Version 1903 – coming in the next month or two, there’s a really good chance that many Windows 10 users will go right from Version 1803 to Version 1903 without ever installing Version 1809. Version 1809 is not a prerequisite for Version 1903 and 1903 has all the features of 1809 plus some really nice new features. So, officially you can be up to date if you’re still using Windows 10 Version 1803. And you’re not alone, about 3/4 of all Windows 10 users have not been updated to Version 1809. Our advice, don’t worry, be happy. If you go right from Version 1803 to Version 1903 this spring, you’ll be fine. And once Version 1903 gets close to rolling out, we’ll be covering the new features of version 1903. But don’t get too excited, there are no earth-shaking new features that we’ve seen in the test versions of 1903 we’ve seen – but there are several nice changes coming.